Click here to open a one-up PDF to make printing out single pages easier! 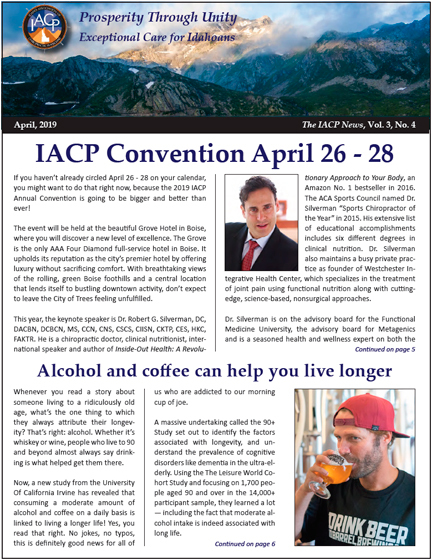 The IACP News, the newsletter of the Idaho Association of Chiropractic Physicians, reaches 600-800 chiropractors across Idaho every month – this includes members of the Idaho Association of Chiropractic Physicians, and students and also those considering joining the IACP. Click the button, below, to get display advertising rates (classified ads should be directed to the IACP). For additional information, please contact C&S Publishing at CandSpublishing@gmail.com. Get your display advertisement into the IAP Marketplace and save BIG! Smaller ads $699 for a year; larger ads $1,199 for a year - PLUS two extra free months! Includes FREE graphic design and ad creation services! If you'd like to get in touch, fill out the form below and we'll get back to you soon. © C&S Publishing ALL RIGHTS RESERVED.